Minot State University is proud of the Class of 2017. More than 695 undergraduate and graduate students were eligible to walk through commencement exercises May 12. Graduate student Katelyn Fornshell, undergraduate student Breanne Hatfield, N.D. State Board of Higher Education member Andy Wakeford, and alumna Tami Jollie-Trottier, a clinical psychologist, addressed the graduates. Prior to commencement, a hooding ceremony for graduate students was held in Ann Nicole Nelson Hall. 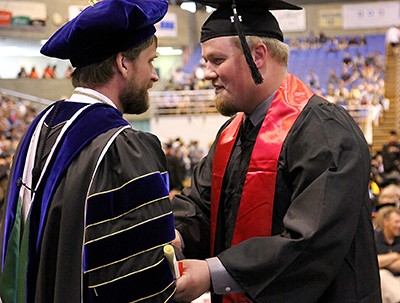 In the photo, Steven Shirley (right), Minot State University president, congratulates Logan Gunderson on completing his bachelor’s degree. Teaching — Kristi Berg, associate professor of business information technology, has taught at Minot State University since 2001. The MSU alumna always had her sights set on becoming a teacher, but truly found her calling when she had the opportunity to teach at MSU, while obtaining her master’s degree. When she began teaching at MSU, the opportunity to teach online was a new venture and one she embraced. Berg has developed and taught both online and campus classes since beginning her career at MSU. In fact, she achieved her doctorate online in 2011. As an online learner, she found she grew as a teacher through practice, research and evaluation. She teaches both undergraduate and graduate classes in the field of information systems. Berg also enjoys facilitating workforce training and development seminars via MSU’s Center for Extended Learning. Berg embraces an active teaching and flip learning style which challenges learners to become better prepared to explore content in greater depth. She uses humor and wit to engage students while they explore the ever-changing field of information systems. Berg serves as a mentor to senior students in the information management information systems program as they prepare to enter the workforce. Her passion for teaching is frequently noted on student evaluations and is evidenced by the steady stream of students visiting her office on any given day. Teaching is her place, the place where she continuously strives for excellence, professional growth and student success. Service — Niki Roed, assistant professor of nursing, has taught at Minot State University and served as the Department of Nursing chair since 2011. Roed serves as a teacher, advisor, mentor, manager and leader for nursing students, faculty and staff. Roed embraced the challenge of transitioning from nursing practice to academics. Under her leadership, the Department of Nursing received continued North Dakota Board of Nursing approval and continued national accreditation by the Accreditation Commission for Education in Nursing. In addition to her department responsibilities, she served as a member for the University Prioritization and Budget Recommendation Committees. She has also been a member and chair of the Faculty Senate Budget and Salary Committee. Roed is active in the North Dakota nursing community and is involved in the North Dakota Center for Nursing, College and University Nursing Education Administrators, and the N.D. Board of Nursing Education Committee. As a retired military officer, she is also an active member of the VFW and American Legion. A family that cherishes education, Roed and her husband Dale, Edison Elementary School principal, are both MSU alumni. They have two children, who are MSU graduates as well. Scholarship — ShaunAnne Tangney is a professor of English at Minot State University, where she teaches American literature, critical theory and creative writing. Her scholarly interests focus on the literature of the American West. She is a noted Robinson Jeffers scholar and has published several essays on the poet and his work as well as a collection of critical essays titled “The Wild That Attracts Us: New Critical Essays on Robinson Jeffers,” published by the University of New Mexico Press. She has also published essays and book chapters on, among other things, undergraduate research, flood and flood recovery in Minot, Great Plains literature and aesthetics, film noir and the American Dream, and has work forthcoming on teaching aesthetics and surf noir. Her essay on Montana poet Paul Zarzyski was nominated for the Don D. Walker prize for the best writing on literature of the U.S. West. She has presented at more than 50 academic conferences, most of them at the national level. She is also a poet, and her work has been published in the United States, Great Britain and Australia. For Andrew Heitkamp, Veterans Center director, April 2017 marks the completion of year three. The center serves as a guide for active duty, transitioning active duty, veterans, military dependents and spouses into the university education system. Center staff strive to ensure those individuals are able to put earned benefits to use in a quality education here at Minot State University, providing referrals to academic and financial assistance as well as to physical and mental health well-being support. Military service, both federal and state, is entrenched in Heitkamp’s upbringing. His grandfather was a World War I veteran, his father a World War II veteran, and his brother a Gulf War veteran. He has spent eight years serving in the North Dakota Army National Guard 1/41 ECB, being honorably discharged August 1991. The opportunity that he was afforded to serve the North Dakota University system, working with university students over the past 29 years, 26 years in athletics, has fostered many teachable lessons for students, and he has developed many partnerships. The Matador native earned his bachelor’s degree in physical education from Mayville State. He and his wife, Deb, have three children and eight grandchildren. Gretchen Ingledue began her journey at Minot State University Sept. 5, 2006, as an athletic facilities worker at the Dome. Ingledue transferred to the main campus custodial staff April 2007, cleaning in Memorial Hall and the Student Center in the bookstore and the pool and anywhere else she was needed. In April 2010, she became a day team leader and was promoted to custodial supervisor in July 2011, the summer of the flood. In 2009, the Ohio native, who was raised on a farm, became an active member of the Sustainability Committee and was its president from 2012 to 2014. During that time, she organized Earth Day activities. In 2016, she was elected to Staff Senate. The life goal for Ingledue is to make a difference in someone else’s life: to make them smile or make their day just a little bit better than it was. She and her husband, Nick, have three children. 5 Years — Chuck Barney, Severson Entrepreneurship Academy; Micah Bloom, humanities; Paul Cristofaro, humanities; Ashley Dhuyvetter, North Dakota Center for Persons with Disabilities; Lisa Dooley, Title IX; Ann Haider-Bougard, veterans services; Erik Kana, teacher education and human performance; Michael Klemp, facilities management; Kevin Kvale, NDCPD; Kevin Lawson, facilities management; Rhonda Lenton, facilities management; Forrest Macy, enrollment services; Janna McKechnie, Alumni Office; Annette Mennem, Native American Center; Charles Moody, facilities management; Jacek Mrozik, College of Business; Brandon Neiss, security; Kelly Prellwitz, NDCPD; Niki Roed, nursing; Celeste Simmons, academic affairs; Teresa Slack, Gordon B. Olson Library; Dionne Spooner, addiction studies, psychology and social work; Steven Swenson, athletics; Janan Thom, enrollment services; Nicole Thom-Arens, humanities; Bonnie Trueblood, advancement; and Marilyn Undhjem, NDCPD. 10 Years — Luke Blikre, facilities management; Karla Bredahl, science; Paul Brekke, Wellness Center; Libby Claerbout, international programs; Nancy Mickelson, Student Health and Development Center; Sarah Henderson, Gordon B. Olson Library; Lori Ihli, biology; Gretchen Ingledue, facilities management; Kelly Lichtenberger, mathematics and computer science; Marv Semrau, advancement; and William Triplett, athletics. 15 Years — Judy Bacon, teacher education and human performance; Kristi Berg, business information technology; Laurie Geller, academic affairs; Deanna Head, business administration; Rick Hedberg, advancement; Jolina Miller, Center for Extended Learning; Cari Olson, institutional research; Scott Peterson, facilities management; Kari Schmidt, Center for Extended Learning; Margaret Sherve, humanities; and Donna Ziegler, communication disorders. 20 Years — Lori Garnes, NDCPD; Cindy Geyer, Business Office; William Harbort, humanities; Linda Madsen, NDCPD; Paul Markel, addiction studies, psychology and social work; and John Webster, science. 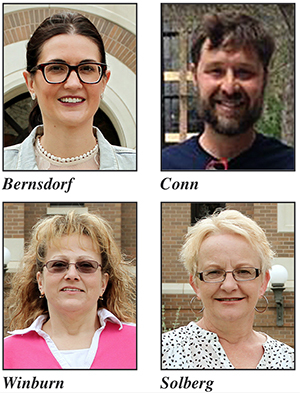 25 Years — Bethany Andreasen, social science; Karen Brunner Wright, College of Education and Health Sciences; Rita Curl-Langager, addiction studies, psychology and social work; Scott Kast, mathematics and computer science; and Susie Mack, NDCPD. 30 Years — Robert Crackel, science; Linda Cresap, business information technology; Conrad Davidson, College of Arts and Sciences; Harry Hoffman, social science; Stewart Kelly, social science; Kevin Vang, mathematics and computer science; and Doreen Wald, publications and design services. 35 Years — Karen Holmen, public information and student publications; and Gary Ross, business administration. To commemorate Memorial Day, the Minot State University Veterans Center will host a Poppy Day Event May 26 at 11:30 a.m. in the Student Center Atrium. The red remembrance poppy is a familiar emblem of Remembrance Day due to the poem "In Flanders Fields" written by Canadian physician John McCrae. These poppies bloomed across some of the worst battlefields of Flanders in World War I; their brilliant red color became a symbol for the blood spilled in the war. An optional Search and Discover event in the First Lutheran Cemetery will follow the brief presentation. For questions, contact Andy Heitkamp, Veterans Center director, at Andy.Heitkamp@minotstateu.edu. Minot State University Summer Theatre celebrates its 52nd season at the MSU Amphitheatre June 12 through July 16 with “A Midsummer Night’s Dream,” “Alice in Wonderland,” “Wizard of Oz” and “Rock of Ages.” Detailed descriptions of each play are online. Nestled in the grassy hillside north of the campus, the amphitheater has been home to MSU Summer Theatre since 1971. Boasting exceptional views of the stage and Minot, it delivers the perfect spot for a night of theater under the stars. All performances begin at 8:30 p.m. The box office opens the evening of each performance at 7:30 p.m. Ticket prices are: $15 adults; $10 seniors and MSU students, faculty and staff with current MSU ID; and $5 for all youth age 18 and under. For reservations or questions, call 858-3228. The Student Government Association selected Tawnya Bernsdorf, Dan Conn, Eileen Solberg and Naomi Winburn as 2016-17 Professors and Advisor of the Year. 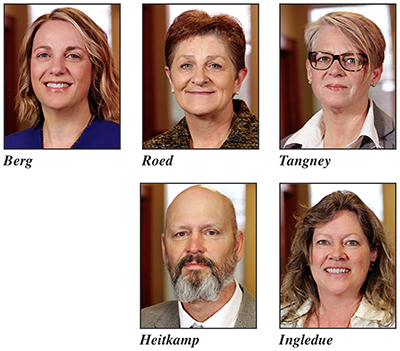 These awards honor faculty members from Minot State University’s three colleges and one faculty or staff advisor for their dedication to students. “Student Government Association recognizes the commitment and remarkable work of Minot State professors and advisors and congratulates the 2016-2017 recipients for what they do in and outside of the classroom,” said Aaron Richards, SGA president. Bernsdorf, business administration instructor, was selected Professor of the Year for the College of Business, Conn, assistant professor of teacher education and human performance, was chosen for the College of Education and Health Sciences. Winburn, chemistry instructor, was selected as Professor of the Year for the College of Arts and Sciences. Solberg, College of Business advisor and student relations, was named Advisor of the Year. The North Dakota Center for Persons with Disabilities, a Center of Excellence on the Minot State University campus, was recently awarded $50,000 from North Dakota State Council on Developmental Disabilities to implement Bringing Resources Into Developing Gainful Employment or BRIDGE the Gap demonstration project. BRIDGE the Gap will foster advocacy, involvement, and community expectations to build the capacity of community inclusion of 18 to 21-year-old individuals with disabilities into employment opportunities. Rhonda Weathers, BRIDGE the Gap project director, indicated the project will train teachers to understand the discovery, customized employment and job development processes. It will help support youth to gain integrated competitive employment in their area of interest. “These opportunities will enable youth to develop their own capacities into adult roles as employees and into their communities as citizens. They will become self-determined adults,” Weathers said. For questions about BRIDGE the Gap project, contact Weathers at Rhonda.l.Weathers@minotstateu.edu or 858-3821. 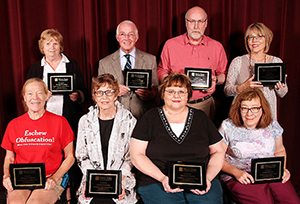 Minot State University employees, who recently retired or will retire at the end of this semester, were honored May 10 at the Employee Recognition and Retirement Event. Pictured, left to right, in the front row are Margaret Sherve, humanities; Nancy Pearson, humanities; Melanie Moore, Student Health and Development Center; Linda Benson, public information. In the back row, left to right, are Sherry Wheeling, humanities; Frank McCahill, humanities and student publications; Thomas Froelich, communication disorders; Diane Sjol, nursing. Not pictured are Shirley Cole-Harding, addiction studies, psychology and social work; Donna Harvey, library; Pam Hopkins, veterans services; Susan Mosser, MSU food service; Orlene Schroeder, communication disorders; ShaunAnne Tangney, humanities; Mark Timbrook, Center for Extended Learning; and Nelrene Yellowbird, addiction studies, psychology and social work. Minot State University’s Westlie Room proved the right venue for an April 4 presentation by World War II veterans. Lynn Aas, who fought in the Battle of the Bulge, and Ben Tollefson, who was sent to Japan, talked about their experiences in History Professor Ernst Pijning’s U.S. History since 1877 class. The students paid full attention as they heard how Aas was received in Belgium, 70 years after he helped to liberate the area from Nazi occupation and defeated the last German offensive against the American troops. The people of Belgium were grateful indeed, as Aas was personally honored by the local community, by school classes, as well as battle field impersonators. Yet the most dramatic event was Aas’ visit to Margraten, the large military cemetery in the Netherlands. On two occasions, he visited the graves of comrades buried there, actually some of them had died right by his side. In Germany, he participated in Operation Varsity, the largest airborne operation in World War II, meant to let the allied forces safely cross the Rhine and capture the German heartland in 1945. Aas was sent in a glider, and of the five soldiers, only one remained unharmed. Aas was wounded on the battlefield and that was the end of the war for him. The students also listened to Tollefson, who was transported by ship to the Pacific. However, before he saw active combat, the two nuclear bombs had been dropped in Hiroshima and Nagasaki, which ended the war. Both Tollefson and Aas explained that this had probably saved their lives. As horrible as dropping the bombs was, it ultimately saved the lives of many people. Aas and Tollefson were assisted by Aas’ son David, an MSU alumnus, and their friend, Bob Marquardt, who organized the activity. The students posed many questions, not only about the war itself, but also about the lives of veterans afterward. In the end, all believed that it was a great honor to receive the veterans in the room that was designated to Minot States’ contributions during those trying times. In the photo, Aas addresses MSU students. May 15-June 22 — “Views from the High Plains,” watercolor paintings by artist Leith DeWeese, Hartnett Gallery. May 18-June 16 — “Prairie Impressions,” paintings by North Dakota artist Nicole Gagner, Library Gallery. Department of Communication Disorder students raised funds for 11.45 surgeries at $240 per surgery at this year’s Miles for Smiles Walk. That makes more than 212 surgeries in six years. Megan Fixen, business administration instructor, successfully defended her doctoral dissertation, “Contrasting the Corporate Social Responsibility Perceptions of Generation X’ers,” and has received a doctorate in business administration with an emphasis in management. Kowan O'Keefe, POWER Center supplemental instruction coordinator and academic coach, co-authored a paper with S. J. Kaldas, R. Mendoza-Sanchez and A. K. Yudin, University of Toronto researchers and professors, "Amphoteric Borylketenimines: Versatile Intermediates in the Synthesis of Borylated Heterocycles," that was just accepted for publication in Chemistry: A European Journal. Sayeed Sajal, assistant professor of mathematics and computer science, was one of nine speakers April 24 at North Dakota State University’s TEDx event. He spoke about a device he created to aid the health care community with patients with incontinence. His invention is a battery-less, inexpensive and disposable adult diaper with a censor that can indicate to the nurse on call when a patient needs to be changed, making the lives of patients and nurses simpler and more sanitary. Doug Tiedman, instructional design and media specialist for the Center for Extended Learning’s Office of Instructional Technology, successfully completed an eight-week course of study to become a certified faculty developer. The intent of the certification is to prepare instructional designers and other online support staff to assist faculty in developing high quality online and hybrid courses. The course covered various areas including student learning styles, multimedia for e-learning, assessment and retention, hybrid course design and much more. This certification strengthens CEL’s commitment to providing the best support possible to MSU’s students and faculty.